If you were a fan of the Blue Bomber back in the days of the NES, then it will be hard for you to pass up on the Mega Man Legacy Collection, even if you've played and beaten every one of the six games in this collection. This isn't a remake or a remaster as much as it is a re-release, and you even have the option to play the games as they were originally enjoyed, in a 4:3 aspect ratio and with filters applied to make the picture on your high tech HD flat screen look like they are coming out of a flickering mid-80s big box TV. If you're returning for nostalgic purposes then there's a lot here for you to love. Nothing has been done to change the gameplay in any way - nothing's been re-skinned, re-programmed, or re-imagined. The gameplay is as challenging as ever, rewarding smart and well-executed play over brute force and button-mashing. The game is fair but uncompromising, and it won't hand you anything that you haven't earned. The easily-frustrated and frequent rage-quitters are advised to keep moving and look elsewhere for their next game. Each game follows the same basic template - Dr. Wiley has created a collection of eight robotic villains and it's up to Mega Man to stop them. Each of these villains awaits at the end of a stage to do battle with Mega Man, but first you'll need to guide Mega Man through the stage leading up to it and survive the onslaught of minions. 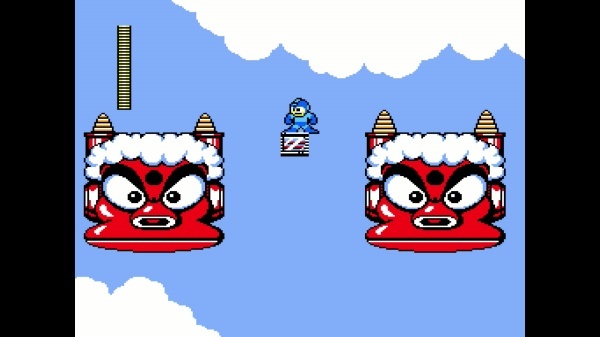 Each stage is uniquely themed to match its robotic master, so Fire Man's stage is filled with flame-related hazards and you can expect electrical dangers in Elec Man's. It's not just the theme that changes between stages, though, you'll also have to contend with gameplay variations such as disappearing platforms or moving walkways. Each stage is made up of a series of screens that feature the classic platform game environmental dangers such as pits and platforms in addition to a host of enemies. It's not necessary to destroy the enemies, but doing so will certainly make it easier for you to reach the end of the screen and transition to the next. Your slow rate of fire and the fact that each enemy has a unique attack pattern both conspire against any plans of taking an attack by mutton-mashing approach, and, in fact, trying to do so is a good way to meet a quick demise. Should you manage to defeat one of the robotic bosses your reward will be the ability to wield the defeated boss' special weapon. The trick here is that each boss has a vulnerability to one of the other boss' weapons, and beating a boss is very difficult without that special advantage. Part of challenge in the game is figuring out which bosses to take on in which order. If that seems like a daunting task to you, though, you can always do a little reading to find each boss' vulnerability. The game comes with an extensive encyclopedia of all things Mega Man so you can hone your strategy after reading the scouting reports on your foes. You can even use the encyclopedia to fight practice battles with the bosses, working out their patterns and the best weapons to use against them before you have to fight them in the game. The practice battles are not the only way to enjoy Mega Man gameplay outside of the main games. 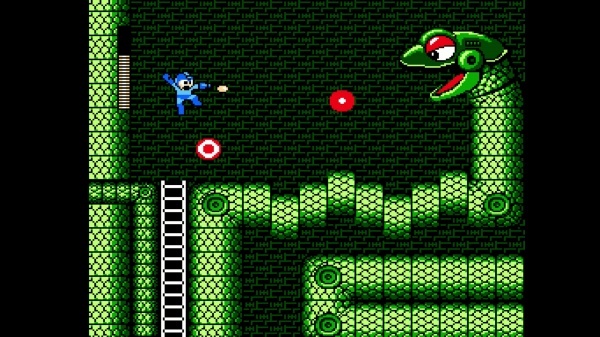 The Mega Man Collection adds a Remix mode that presents timed challenges built from small sections of the games' levels placed back to back. These are more challenging in their own right than the original games, not just because of the timer but because you can't get into a groove in the same way that you can with a full-size game level. Make it to the portal at the end of the current screen and, bam, you're suddenly in an entirely new zone. And when you make it to the end you can see just how skilled you are by comparing your performance to that of other gamers on the leaderboards. The games hold up well from a gameplay perspective decades after their original release, especially since so many indie games feature the same 8-bit style graphics that the Mega Man games debuted with. Modern gamers without the benefit of nostalgic memories of the originals may not find the inclusion of the games' shortcomings like framerate issues to be at all welcome or charming, but gamers of any generation will appreciate tough but fair games that will put their skills to the test. Final Rating: 86% - The original generation of 8-bit gamers will love this collection.